It’s been one of the hottest topics since the 2017 season ended, and one the Steelers defense is determined to get right. According to Pro Football Focus the Steelers were ranked 31st overall in the NFL in missed tackles on run plays. A ranking they don’t want to ever repeat. Tackling is something that has been a point of emphasis this training camp. The topic has come up in the preseason games. But how do you teach tackling? New defensive backs coach Tom Bradley has a method and a philosophy and it starts with feet, face and hands. It’s about your feet being in proper position, your face and eyes looking the right way, and your hands aligned, making sure everything is working together. It’s nothing new. It’s about proper technique. Fundamentals are a key with him. It’s nothing groundbreaking, but it’s something the defense is working on. 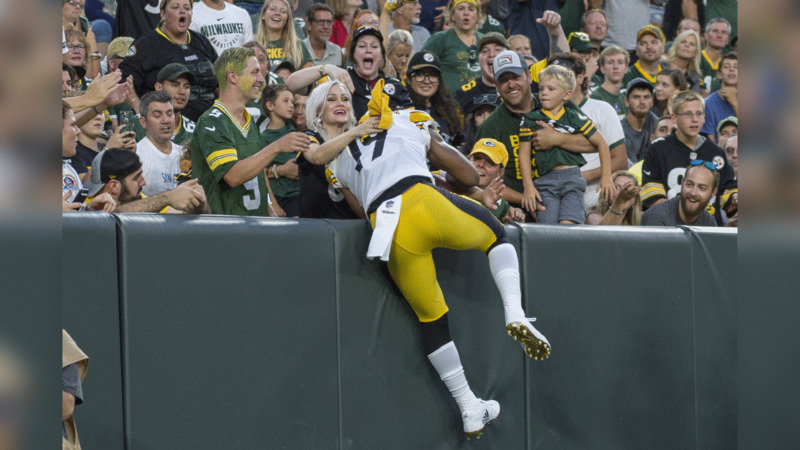 A 2018 Preseason game between the Pittsburgh Steelers and the Green Bay Packers on Thursday August 16, 2018. “A lot of it is want to,” said Joe Haden. “We do a lot of drills in individuals, wrapping up, keeping our eyes up, hands around, wrap tackle. Not just dive at peoples legs. We drive it out a lot. In our 11-on-11s we make sure we end with it. Even if you are not going to take him to the ground, get in position, back hip, get yourself in position to make the tackle. We always finish at the ball. Haden is someone who has been stressing tackling. So has Cameron Heyward. And as leaders on the defense, you know they will turn it around. “We are staying on people,” said Haden. “The thing with me, Cam, guys like that we have to lead by example. All of the drill work we are doing, I am making sure I am at the front of the line, finishing all of the tackle drills, making sure I am wrapping, making sure I am using the proper technique. In 11-on-11, making sure I am running to the ball, tagging off on the low hip. When we have the live tackling you have to get him on the ground and show him what you can do. Santonio Holmes will be there (and getting slimed). Will you? Join us at @heinzfield for #FamilyFest on Sunday, August 19 from 5-9 PM.